Ring of Honor returns to pay-per-view tonight as Best in the World 2018 takes place at the UMBC Event Center in Baltimore, Maryland. 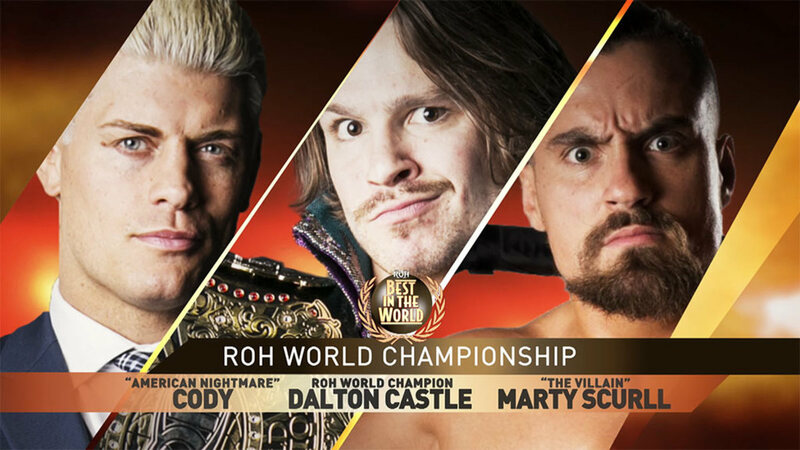 The show will be headlined by a triple threat match for the ROH World Championship, with Dalton Castle defending against Bullet Club members Cody Rhodes and Marty Scurll. If Cody wins the championship, he'll be set to defend it in a title vs. title match against the NWA Worlds Heavyweight Champion, which is currently Nick Aldis, at All In this September. Three other title matches are also set for tonight: Tag Team Champions The Briscoes vs. The Young Bucks, Six-Man Tag Team Champions The Kingdom vs. SANADA, EVIL & BUSHI, and TV Champion Punishment Martinez vs. Hangman Page in a street fight. Austin Aries vs. Kenny King, Jay Lethal vs. KUSHIDA, an eight-woman tag match pitting Sumie Sakai, Mayu Iwatani, Tenille Dashwood & Jenny Rose vs. Kelly Klein, Hazuki, Kagetsu & Hana Kimura, and Bully Ray vs. Flip Gordon round out the rest of the card. Our live coverage starts at 9 p.m. Eastern time. Match was fine. It never got past a certain level but it was all action. Sanada did a Paradise lock on both Taven and Marseglia. But not much else as far as big stuff went. The finish saw Taven pin Bushi after rock star super nova. The match opened hot with Gordon doing dives and brawling. This was a very different style of match then you usually see from Gordon. Bully got litlte offense in, missed a Vader bomb to get a Vader chant and then used a low blow for the DQ. After the match Bully kept beating down Gordon with a garbage can and some chair shots. Eli Isom ran in but Bully Ray beat him down. Cheeseburger ran in and Bully Ray power bombed him hard. Finally Colt Cabana, doing the announcing, hit the ring with a chair and Bully backed off. Bully is super smart at getting heat so while not a classic match, this match was exactly what it was supposed to be and effective, it made Gordon show a new dimension and put heat on Bully. HAZUKI & KAGETSU & HANA KIMURA & KELLY KLEIN VS. JENNY ROSE & SUMIE SAKAI & MAYU IWATANI & TENILLE DASHWOOD. This match got over in the last few minutes. I thought it wasn't good at all except when Iwatani was in with both Hauzki and Kimura. The crowd went nuts for Iwatani vs. Kimura in particular. Sakai did a great plancha onto everone and in the ring, Iwatani pinned Kimura with a dragon suplex. They tried to push Sakai vs. Kagetsu as WOH champino vs. Stardom champion. The story here is that Aries and King were friends and Aries mentored him. King wouldn't go for the kill but Aries would. Aries is a great wrestler and this match had a lot of heat. At one point Aries grabbed his three belts and went to walk off but King with a corkscrew plancha on him and then grabbed the Impact belt. However, Aries came back with a brainbuster on the floor and then won with a discus elbow and a brainbuster. Best match so far. Silas Young and Beer City Bruiser are out on commentary.. Thois was a realy wild match with a lot of high spots. Martinez won with a choke slam through a table shortly after Page gave him a back body drop on thumbtacks. Page also did a moonsault off the top to the floor At one point Martinez zip-tied his hands together butg Page got free of them. Page speared him through a table on the floor. Page also supeplexed him off the barricade on the floor. It was a big brawl and the crowd completey got behind Page. This was very close to a match of the year level bout. They did everythimg in the world and it ended with the Briscoes doing a double team die hard and neckbreaker on Matt for the pin. They pushed that the ROH champs beat the IWGP champs clean so that probably sets up a rematch. There were far too many big spots and near falls to recount. At one point The Bcks had it won with more bang for your buck on Jay, but Mark gave ref Paul Turner an elbow off the top to take him out. Later the Bucks did the Meltzer driver but there was a save. Matt kicked out of a Jay driller on a chair. At another point they tried another Meltzer driver but Mark threw a chair at Nick which knocked him off the apron. After the match, they continued to beat on the Bucks until SCU came out with Christopher Daniels having a chair. They teased attacking the Young Bucks but instead Daniels hit Jay with a chair. Castle retained the title as Scurll did the crossroads to Cody but Castle then gave Scurll the bangarang and pinned him. Castle is hurting really bad. I think he took maybe one or two bumps. His back is a mess, both a fracture and nerve damagee. There was all kinds of shortcuts with lots of near falls and then people pulling the ref out of hte ring. Brandi and Cody pulled ref Todd Sinclair out when Scurll had the title won with a belt shot. At another point Scurll had Scurll pinned with the bangarang but Nick Aldis, who was at ringside pulled Sinclair out of the ring. Sinclair later threw Brandi, The Boys and Aldis out. The near falls were really good and a lot looked like the finish but it was tough to follow the prior match. Aldis being there made everyone figure Cody was winning, but I guess the idea is they don't want the ROH champion losing to the IWGP champion again.